Our standard range of BS EN3 kite marked fire extinguishers provide the reassurance of quality and optimum performance and come with a 5 year warranty. 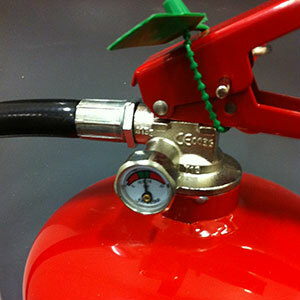 To go with the fire extinguishers we have a range of fire extinguisher stands and safety cabinets. 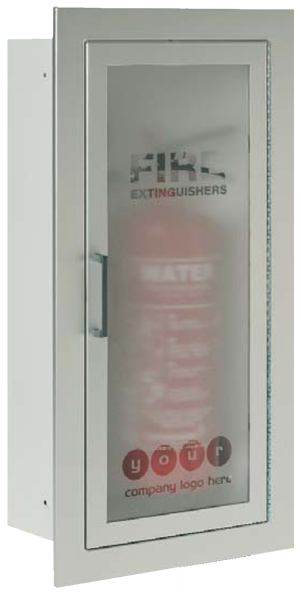 BS5306-3:2009 regulations state that the extinguisher must be in a stand or in a wall mounted cabinet. 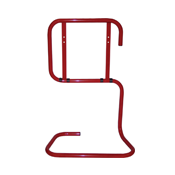 The stands are used to keep your extinguishers upright and easily accessible. The safety cabinets come in a range of different finishes and there are also many options to choose from, such as recessed or semi-recessed. 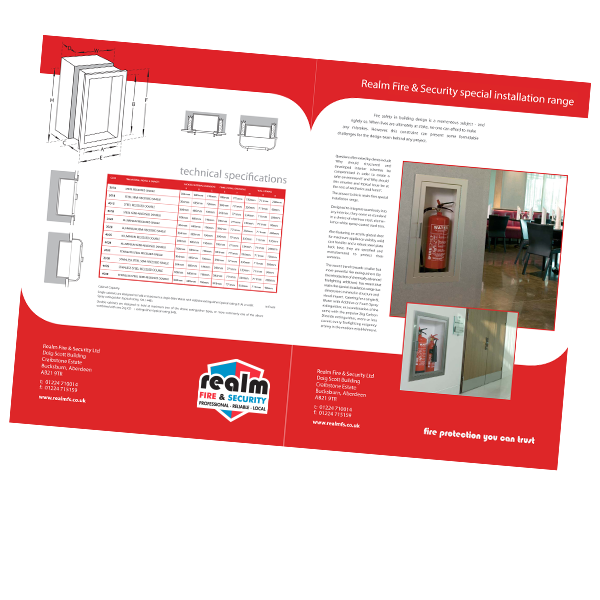 You can download our brochures of the different ranges we offer in stands and safety cabinets by clicking the images below and downloading the PDF. Our standard range of BS EN3 kite marked fire extinguishers provide the reassurance of quality and optimum performance and come with a 5-year warranty. 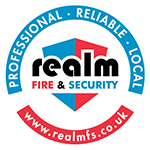 Realm Fire & Security can offer high-gloss polished stainless steel cylinders for use where appearance is important. 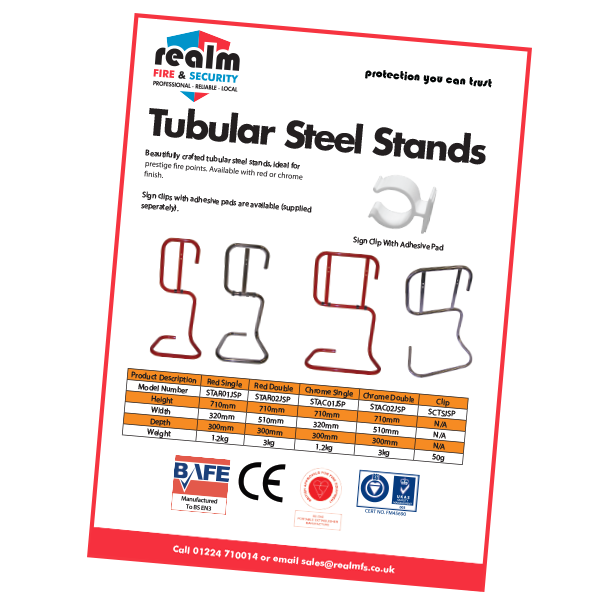 Red tubular steel stand for a single fire extinguisher, ideal for prestige fire points. 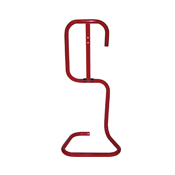 Red tubular steel stand for two fire extinguishers, ideal for prestige fire points. 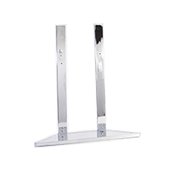 Chrome tubular steel stand for a single fire extinguisher, ideal for prestige fire points. 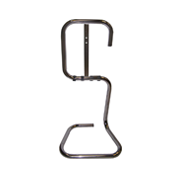 Chrome tubular steel stand for two fire extinguishers, ideal for prestige fire points. Manufactured from steel with chrome finish. Decoritive chrome base cover. I.D. Sign can be fitted above the extinguisher. Base angled so that stand can be fitted into the corner of a room if required. Manufactured from steel with chrome finish. Decorative chrome base cover. I.D. Sign can be fitted above the extinguisher. 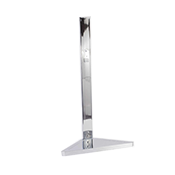 Base angled so that stand can be fitted into the corner of a room if required. Multiple brackets and fixings supplied. Adjustable bracket heights. 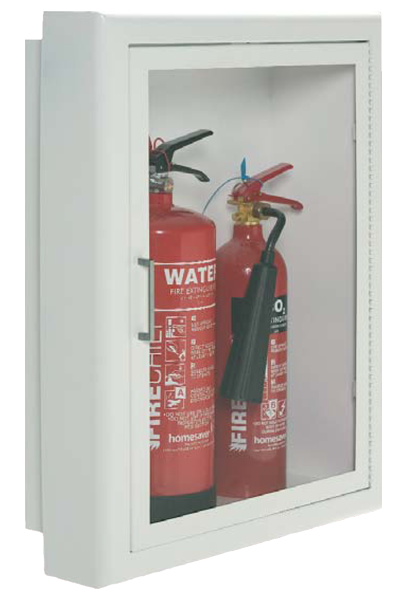 Single cabinets are designed to hold at maximum a 6-litre water extinguisher or a 6-litre spray extinguisher. 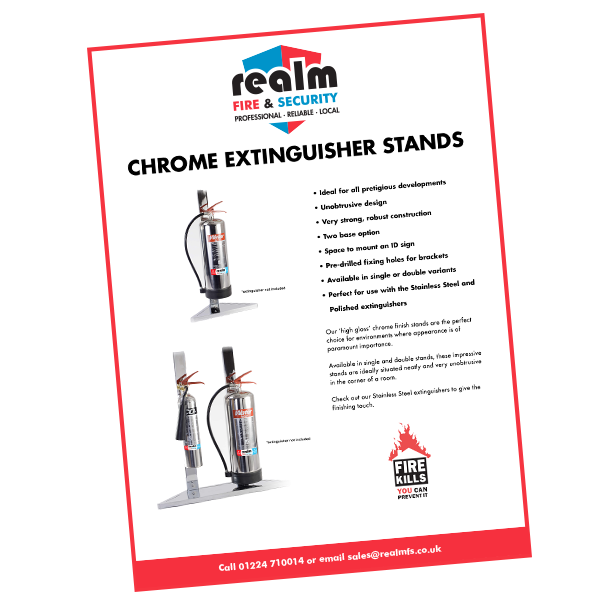 Double cabinets are designed to hold at maximum two of the above extinguisher types, or more commonly one of the above combined with one 2kg C02 extinguisher. Designed to integrate seamlessly into any interior, they come as standard in a choice of stainless steel, aluminium or white epoxy-coated steel trim. Also featuring an acrylic glazed door for maximum appliance visibility, solid cast handles and a robust steel plate back base, they are specified and manufactured to protect their contents. 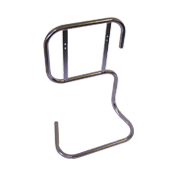 If our standard finishes are too restrictive for your requirements, endless possibilities are available by special request. Solid doors, locking catches or bespoke etched-look glazing, are some of the options available. 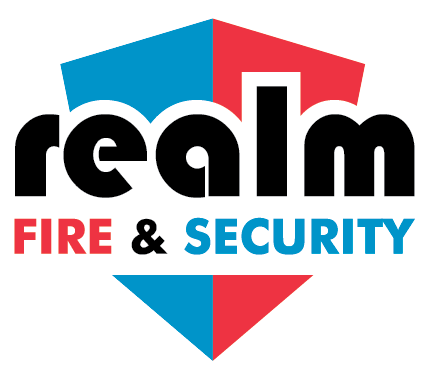 The Fire Safety (Scotland) regulations 2006 and with reference to BS5306-3:2009 also states that “extinguishers sited in schools require extra thought to avoid such accidents and the use of recessed housings should be considered.” This is why Realm offer recessed and semi-recessed cabinets to meet the needs of our clients and the regulations. You can choose between 3 trim materials for the recessed cabinets however if your wall depth does not permit a recessed cabinets then a semi-recessed cabinet still offers a neat and tidy option.